The latest building on the London skyline, KieranTimberlake’s new US Embassy in Wandsworth, is not immediately identifiable as a heavily fortified structure. It certainly doesn’t strike dread into the heart of the visitor, as perhaps the apparently riot shield-clad embassy in Baghdad might, but it’s no easy target for attack either. The full extent of security arrangements are, of course, classified, but standard security for US embassies these days include it being set back from surrounding roads by at least 30m and having protective concrete bulwarks and anti-truck bollards. The building even has what some commentators have laughingly referred to as a ‘moat’, although in truth the ornamental lake is a convenient way of dealing with storm water rather than a real security measure. What the design has achieved is to largely make the passer-by unaware that this is a top-security building. Compared with, for example, Terry Farrell’s M16 building nearby, the transparent cube of the new embassy wears its bulletproof vest lightly. James Timberlake, partner at KieranTimberlake, explains how the design was intended to capture something of the American spirit: ‘The Embassy is a single, compact building rising in the centre of a park; a transparent cube atop a four-sided colonnade. The newly opened 48,128 sq m embassy is said to have cost £750m and was commissioned to meet the highest environmental specifications – it has photovoltaic cells on the roof, uses a ground-source heat pump and recycles grey water, while the high-performing translucent plastic screens stop the building from overheating. It has Outstanding BREEAM and Platinum LEED ratings. 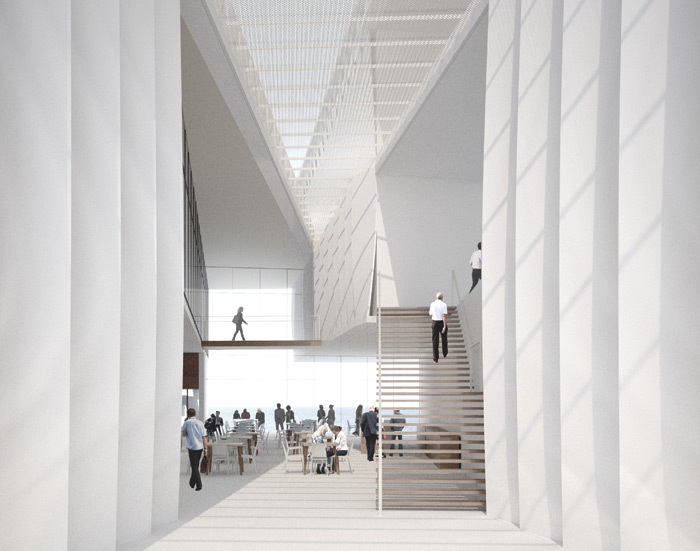 Environmental considerations are also at the heart of the new US Embassy in Beirut, currently under construction. 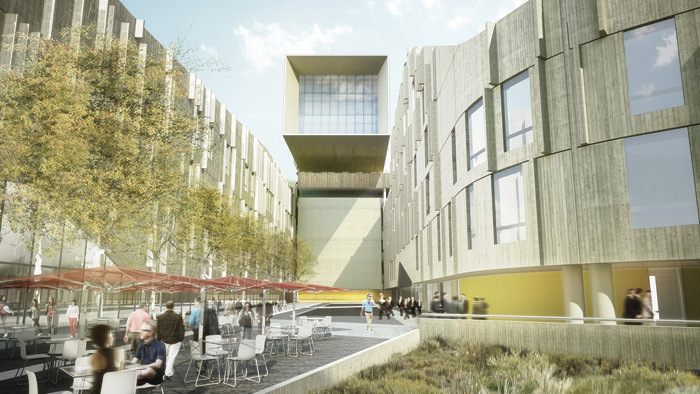 The design by Morphosis is also aiming for LEED Platinum and includes a full waste-water treatment facility on site, rainwater reuse for toilet flushing and a majority of building heating supplied through heat recovery systems. Arne Emerson, principal at Morphosis, believes that this environmental emphasis is part of the job of representing America through a building: ‘Embassies are unique in that they serve as the ‘front door’ for United States diplomacy; they must represent the best of American values and become an integral part of the communities they inhabit. Unlike the single building of the London embassy, Beirut’s 43-acre site, due to be completed in 2023, will be what Emerson describes as ‘an embassy complex that functions like a compact village, defined by a series of ribbon-like buildings and courtyards that weave through the site’. It is intended to sit comfortably in the Beirut landscape with green roofs, gardens filled with native water-saving plants, a white facade that references the light stone-coloured vernacular buildings in the city, and the use of local labour and local building materials. Inside, it will have art works, comfortable waiting areas and shaded gardens. ‘Large expanses of glass in the public areas and material continuity between exterior and interior spaces underscore a sense of transparency and openness,’ adds Emerson. In a sense, it is a full circle in US embassy design – it was 63 deaths in the bombing of an earlier US embassy in Beirut, followed by 200 more killed in attacks in Kenya and Tanzania, that led to the American government putting into place the Standard Embassy Design initiative (SED) that created standard blueprints for heavily fortified embassy buildings. The largest, and last, of these was the embassy in Baghdad. Fortified like a prison, and with nothing to relate it to the local architecture of Iraq, it led Senator John Kerry, the chairman of the Senate Foreign Relations Committee, to bemoan that ‘cold concrete at a forbidding distance, hidden away from city life, with little regard for the local surroundings’ was making diplomacy harder and doing nothing to win hearts and minds. A new initiative was launched, Excellence in Diplomatic Facilities, which saw celebrated architects being called on to create landmark buildings that gave a better impression to local people. Brad Cloepfil is founding principal at Allied Works, commissioned to create the US embassy compound in Maputo, Mozambique, now nearing completion. ‘Our design mission was to respond to the existing culture and context of Maputo and Mozambique, and to represent the embassy as an open and welcoming building, integrally tied to its site and context, while substantially increasing security for American citizens,’ he says. ‘To that end, we conducted extensive visual research on local material and design precedent and spent time in local art museums and galleries, studying the work of local contemporary artists. 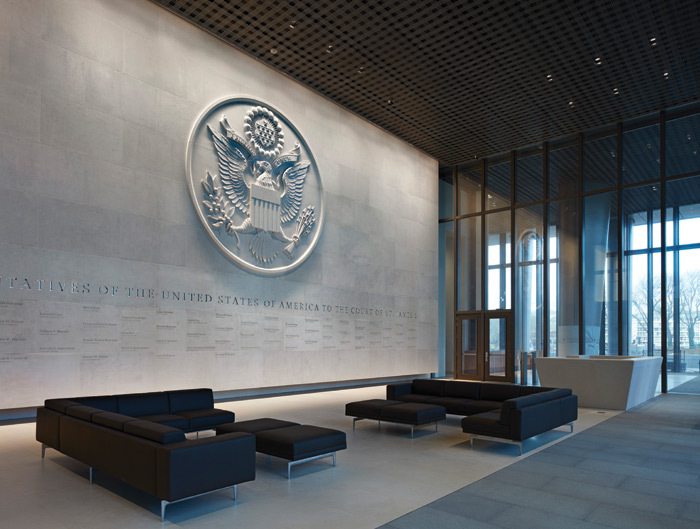 Not all embassies are on the grand scale that the US creates, but the same principles apply. 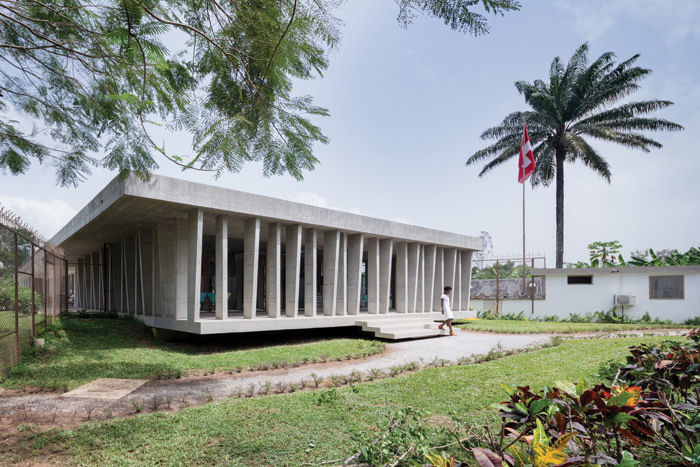 Swiss architect Antoine Robert-Grandpierre, one of the three founding partners of LocalArchitecture, has recently transformed a villa, once owned by the Norwegian government, into a modest Swiss embassy in Abidjan, Ivory Coast. The design was intended to be relatable to local people, while also telling them something of the Swiss ethos. ‘The raw concrete of the construction echoes Abidjan’s magnificent modernist architectural heritage,’ says Robert-Grandpierre. What the future holds for US embassy design remains to be seen, with President Trump proposing extensive cuts to the State Department budget and Republicans criticising the Excellence in Diplomatic Facilities programme for letting feature architecture subvert the normal process of the cheapest option winning the tender. What cannot be in doubt, however, is that the thousand or so visitors a day coming to the new US London Embassy will have a very different first impression of the country than visitors to the Baghdad building.